Glad you're ok, and the bike too. Wow! It's a good thing that you were not sitting on the bike at the time! 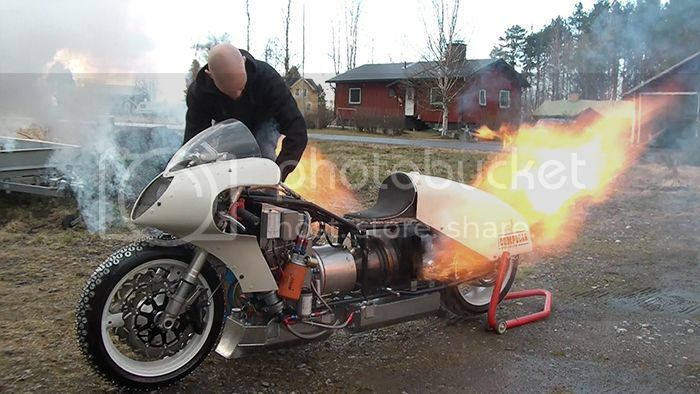 If I were like most of the jet dragster guys I would fit flame throwers like this, flashing lights and loud sirens to make sure every single one was looking at the bike, for some strange reason a jet engine isn't considered interesting enough to gather a crowd. Not much action here in the thread but I have got a fair bit of work done anyway, last weekend I ran the largest half marathon in Europe in Gothemburg and finished 502 of around 50.000 runners at 1:24:50. 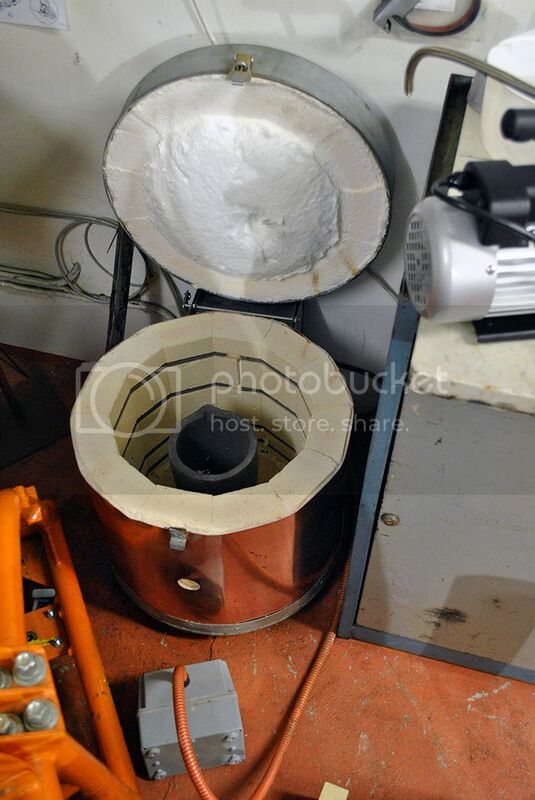 After that I caught a cold that has lasted until now but that couldn´t stop me from updating the casting equipment with a vacuum chamber for lost wax casting and some other stuff. Here I have 3D printed a pair of test pieces in wax filament that I will try to cast tomorrow. 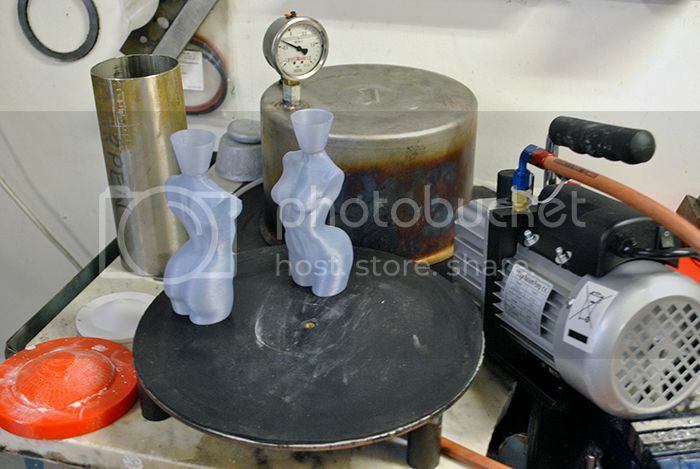 Another thing I will try is to degass the melted aluminum with nitrogen injection down into the bottom of the crucible. 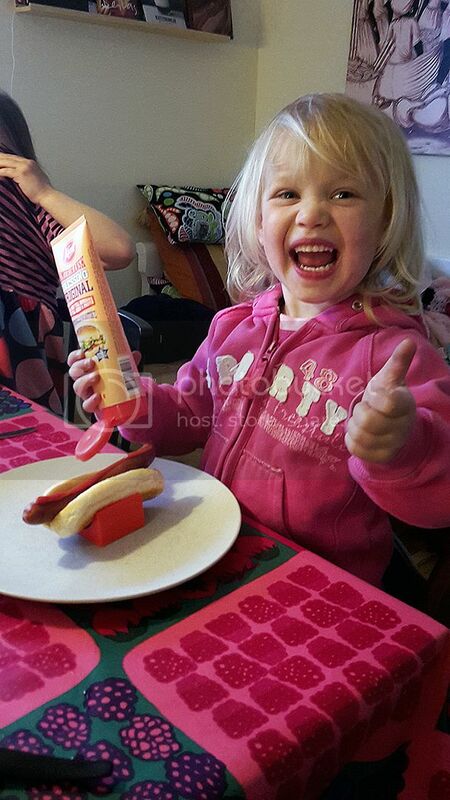 I have also developed a hot dog holder for my kids, the Dodge hotdogs always tip over when they put them down on the plate so I made an experimental holder in the 3D printer. The test subject gave it one ketchup smeared thumb up! Anders, you can do all the technical wizardry stuff you want but the simple hot dog holder is probably what can give you a lifetime income so you can play with all the fancy stuff you want to!!! Bye the way I also see some potential for your lost wax test pieces. I love the hot-dog holder, I HATE that, and will carve one for my kids, great idea! Your tester is uber cute. Peter Jack: I have a couple more of those "why didn´t anyone think of this before" ideas but I am afraid pursuing the ideas until I start making a big profit on them would effectively consume all of the spare time I use to spend in the workshop. No idea having bucketloads of cash if I am too busy to use them. Sabat: Thanks! I actually took up running during the bike development to keep in shape until I would start to race it. I found that I have some sort of talent at it so I try to run at least 30km per week and do a handful of races every summer. A very effective way of clearing the head after a busy day. I´ll make a new design with a bit smoother curves and try to cast it in aluminum, I could probably sell a couple of those to pay for my Argon refills. No patent application though. Olov and I visited the largest custom bike event in Sweden last weekend, 10.000 visitors and decent weather so it was fun. 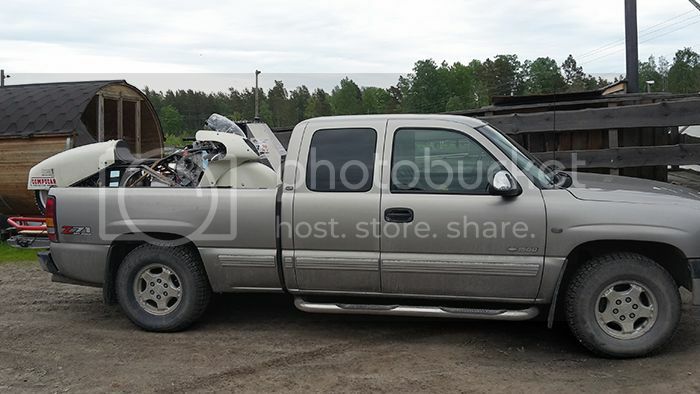 I ran the bike twice but had problems starting it since the propane bottle was as good as empty, it idled a bit low in the video so when I braked the rear wheel the revs dropped below idling and I had to shut the engine down. I have realized that I need to make a bleed valve for the interstage duct to get the idling temps down to reasonable levels, no fun at all with the temps around 750°C when staging in for a run. 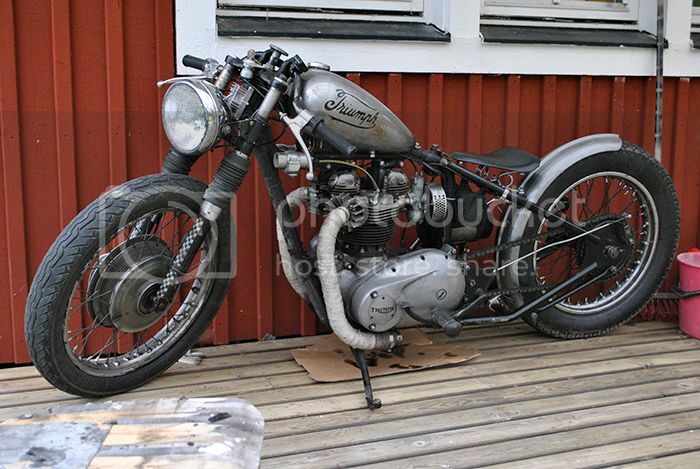 I´ll look into it once the race in September is over, and I´ll try to get the electric starter and tachometer working as well. Anders, they have a class for that bike at Pendine Sands called "Turbine Wheel Powered." The record is 140.81 mph for the standing start mile. It is a nice event and a lot closer and less logistics than a trip to the US. I´ve heard about the Pendine Sands but didn´t think there would be a class for the bike, now it is settled that I will take the bike there. Not this year but perhaps the next one, I´ll bring the family and make it a combined racing/vacation trip! Edit: Where can I find information about the event? At the Straightliners homepage there is some general info about the race but no class regulations as far as I can see, the BUB rulebook can be found in a link but it has no mention of turbine engines. The old Omega class (steam, electric, turbine) seems to be replaced with a solar/electric class so I am a bit concerned that turbine engines are becoming prohibited from the landracing events. 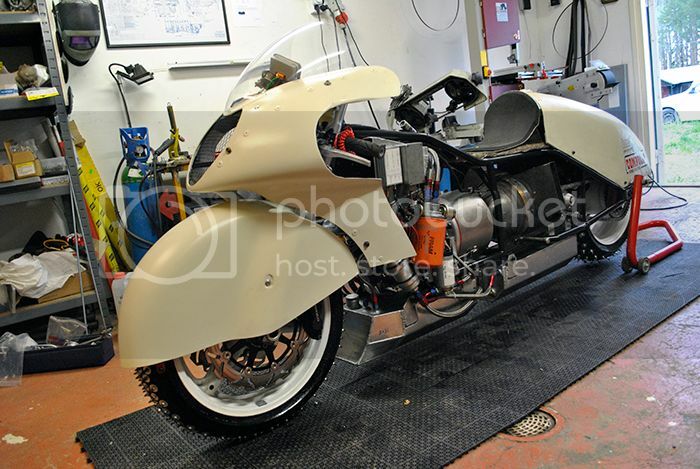 The UK Timing Association (Straightliners Events & SPEE3D Ltd) welcomes turbine wheeldriven bikes at events held on Elvington airfield and on Pendine Sands. The rules can be obtained from Straightliners HQ - when their personnel (Helen in particular) all return from the Isle of Man, where they are running two sprints. 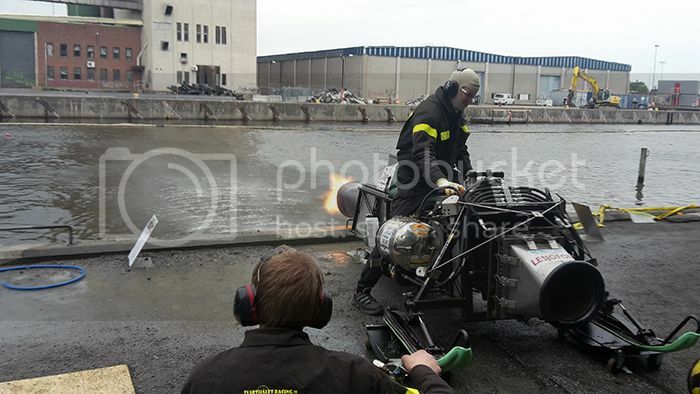 If its a safe bike with a turbine then it will run in Category V.
There is no distinction between a homemade gas turbine or a commercially available unit - the current records are held by the Mad Max team. This year 2015 there record event at Elvington in May was just one week before the Pendine Sandsweekend, not sure we can get these dates in 2016 and avoid the TT build up, but you will be welcomed by all of the racers.